How About Those Giants Backups? You'd be forgiven for trying to forget the drawn-out negotiations after the 2010 season that led, unsurprisingly, to a big-money contract for Derek Jeter to remain with the Yankees. One of the many plot twists during that saga came when Brian Cashman said that he'd encouraged Jeter to test the market and see what other offers might be out there. Of course, he did this knowing that the 36-year old Jeter wasn't going to get a better contract elsewhere and that he was unlikely to play for another team anyway. Which brings us to something Jeter told Rick Reilly in a rapid-fire interview published yesterday. [Reilly]: Peyton Manning changed teams this season after 14 seasons with one team. Could you see yourself doing that? That's enough, even on the day after an important Yankees victory in which they increased their lead in the East to a full game, for Jeter to make the front page of today's Daily News alongside the headline "Say What!" Jeter's not saying anything about the sport that we didn't already know: Baseball is indeed a business, and guys regularly switch teams for more money. Of course, as Jeter learned during his last contract negotiations, the Yankees didn't just offer him a chance to continue playing for the only franchise he's ever known (something we're sure Jeter does care about), they also offered the most cash. It was smart business to stay in New York. It often is. But if we may read into the fourteen words of Jeter's answer just a bit, he's acknowledging the possibility of a scenario in which the following three things are true: That he wants to keep playing, that the Yankees don't want him playing for them (or won't offer him a contract he finds acceptable), and that some other team would indeed both want him and offer him a contract to his liking. We've long doubted whether Jeter would really want to play beyond this current contract, especially if he'd be doing it just to reach more milestones. But if he did, we suppose we could see a scenario in which the Yankees don't want him: If his skills decline and there's no logical place for him to play. But in that case, would another team want him? Presumably, other contending teams would have similar concerns to the perennially competitive Yankees, and it's hard to imagine Jeter finishing his career with a lousy team that wants him on the roster to sell tickets. Jeter saying he'd consider playing elsewhere isn't much different than Cashman suggesting he test the market: Both understood that this is a business, but they also understood that, at least over the course of this contract, both sides had a sort of symbiotic relationship that made the deal possible. Might that change when Jeter's current contract is up? Maybe, but that doesn't mean Jeter will find a desirable situation elsewhere, from a financial point of view, or from a baseball one. 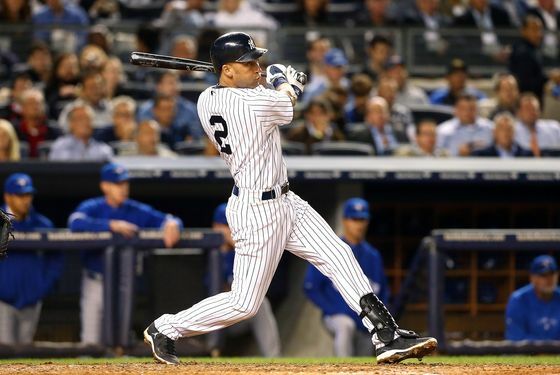 Perhaps most notable of all is simply that Jeter acknowledged the possibility of playing beyond his current contract. Maybe that's not a total surprise, considering his stellar 2012 season, but it's noteworthy nonetheless.